The Beach, Cape May, Rhythm of the Sea – Simply Perfect! 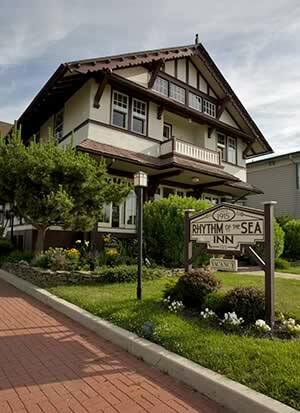 Rhythm of the Sea, where we offer the perfect blend of convenience, comfort and romance surrounded by the beach and the Historic Village of Cape May. Step into the spacious grand salon off the sunny front porch, to the warmth of our welcoming interior–architecturally inspiring and in keeping with the Arts and Crafts Movement aesthetic of simplicity. Relax and refresh in the uncluttered, spacious interior of our Swiss Chalet-style bungalow. Our comfortable rooms are for guests looking for a relaxed accommodation on the beach. Only a short stroll to historic Cape May, the Rhythm of the Sea Bed and Breakfast is a popular choice for a honeymoon getaway or intimate wedding. The interior rooms have mission oak furnishings from the L. & J.G. Stickley collection, with mica lamps, art glass lanterns, and objects from nature that complement the decor. Soft light and sea breezes drift through the rooms from large windows that provide views of the Atlantic Ocean. We offer a beverage fridge, which we stock with spring water and sodas. Use it to chill your wine or beer, as many of the Cape May restaurants are B.Y.O.B. In the guest pantry, we supply ice, ice buckets and wine glasses. Our knowledgeable staff will be happy to make restaurant recommendations and reservations for your desired cuisine. Advance reservations are strongly suggested during the weekends and each night of high season.